In association with Retire Village and Annuity.com agents, Endless Lead Flow has developed a customized campaign that integrates agent name and company into an exclusive geo-targeted campaign. Previously this lead type was only available to Annuity.com contracted agents, but we have now opened up available territories to any annuity agent with an active Retire Village account. Our E-book, Endless Lead Flow, was originally created in 2007 by Super-Agent Bill Broich as a supplement to his agent mentoring process. Over the course of 6 years, Bill has refined his tactics through collaboration with other experienced annuity professionals to create a completely revamped marketing guide for annuity agents. Updated for 2013, this powerful information resource provides insights and strategies developed over the course of several decades, and combines knowledge from industry insiders such as Tony and Chad Owen from Life Agent’s Alliance and Joe and Linda Rych of Retire Village including prospect contact strategies, how to monitor your ROI, and marketing tools that work. Discover proven techniques and management strategies from some of the top performers in your industry. 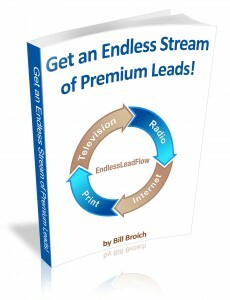 And, of course, discover how to get an endless flow of leads and how to convert more of those prospects into sales. Simply fill out the form now.